This book is undoubtedly a seminal piece whose message is being constantly validated over time. Although partly inspired by Francis’ reaction against the qualities of alienating corporate urbanism which he witnessed emerging during the 1980s, it is the important observations and exhortations about synthesis – or ‘closing the gaps’, as he sometimes called it – which distinguish it from other, narrower works on design, planning, or urbanism. In many ways, by seeking to place urban design at the centre of a vision for a better quality of urban living, he was both of his time and ahead of his time. The mixed use challenge is to secure enough interest to stimulate regeneration through human biodiversity, although there is always the danger of adverse impacts working against the intrinsic qualities which laid the foundations of success. 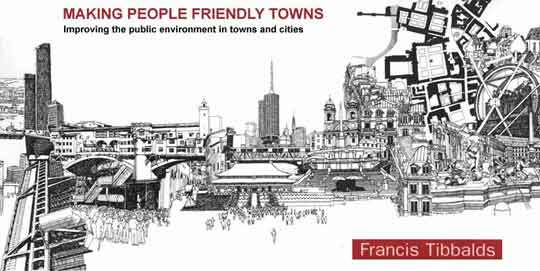 One-time favourites of Francis, such as London’s Covent Garden and Dublin’s Temple Bar, now exhibit some of those problematic qualities. Perhaps they need some constraints on the level of commercial occupancy, as are applied in New York’s SoHo to protect the role of its artistic and creative communities. If those of us who have the opportunity can take forward Francis Tibbalds’ urban design vision with even half of his passion, then together we can make a difference by creating successful places for real people.